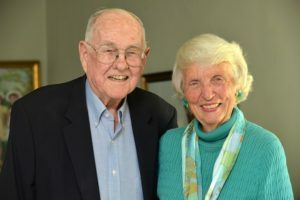 Hal and Marguerite Hennacy met at Stanford University. After they married in the garden of Marguerite’s parents’ home, the Hennacys settled in her hometown, Pasadena. Hal joined his father-in-law in the insurance business. As their family grew to include four children, so did their need for a bigger home. They eventually bought the family home from her parents where Marguerite had lived from the age of 10 years old. Now after 63 years of marriage, the home is filled with cherished memories. In addition to raising their children, Hal and Marguerite became very active in community life. Their involvements are too many to list. A highlight of Hal’s includes his 20-year Board service to the Convalescent Aid Society. Marguerite was involved in many different organizations through the years including the Huntington Library, the Scripps Home, the Assistance League, the Girls Club, Rosemary’s Cottage and Stanford Women’s Club. As loyal supporters of the Pasadena Community Foundation, in 2016 they decided to become one of PCF’s Endowment Builders. “The endowment creates a lasting legacy that will help so many of the local organizations we have cared about and supported through the years,” says Marguerite. This unrestricted endowment supports PCF’s grant programs.